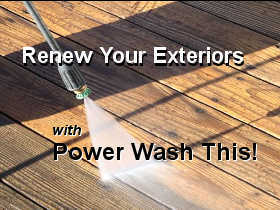 Power Wash This, Inc. has fully trained and skilled technicians ready to handle any pressure washing service. We have been in business since 2002. Power Wash This specializes in commercial and residential properties. We use only the most up-to-date techniques and equipment. We offer the best prices and are committed to providing our customers with the highest quality work. Based in Richmond, Virginia, we offer a host of professional exterior pressure washing cleaning services in Richmond as well as all over Virginia. We do commercial gas stations, shopping centers, parking lots, drive-throughs, sidewalks, sign cleaning, residential houses, decks, roofs, gutters, fences, poolsides, patios, driveways. Our services include low-pressure washing for some jobs such as roofs and vinyl siding. We use only high quality, environmentally safe chemicals for the best cleaning which provides damage-free cleaning. Our popular residential services include house siding washing, gutter cleaning, roof cleaning, cement and surface cleaning as well as exterior painting and post-powerwashing repair and restoration. Our more popular commercial services include sidewalk cleaning, building exterior cleaning, parking lot cleaning and finishing of all these surfaces. Often, our customers have damaged wood or siding that shows up too well once the property is cleaned. We also provide small-project restoration work for our customers such as residential siding replacement and repair, window frame restoration, and deck repair among a host of other restoration services. We send only technicians specially trained to do this type of work. Our reputation is second to none - and we aim to keep it that way! Need something power washed? Call us today for a free quote.